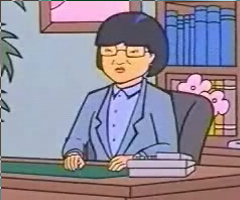 Angela Li is the Principal of Lawndale High, and one of the main antagonists in the series. Principal Angela Li was head educator at Lawndale High during the show's five-year run. She never spoke the name "Lawndale High" without affecting a tone of awe and reverence. Despite her obsession with school security when it comes to crime and disorder, Ms Li is completely willing to ignore lack of safety over maintenance issues ("Fair Enough"); and she's annoyed when Helen Morgendorffer reveals a substitute teacher was sexually harrassing students, because that put her in "a fix" by having to find a replacement. She is also unconcerned with any damage done to the school's ability to educate by her actions or penny-pinching. The Lawndale Lions football team, however, is sacrosanct: in "Fizz Ed", she's only bothered by the budget squeeze when it affected the team. When it comes to wages or employee benefits, Li is monstrously tight-fisted. She is also known for extreme corruption: she not only allows sports players to have their grades fixed but is actively involved in pressuring teachers to do it ("See Jane Run", "Mart of Darkness") and, in one case, blackmailing a student over it ("See Jane Run"). A running gag in the series was the vast amount of money spent by Ms. Li out of the school budget, often without even telling the other teachers. In one second season episode, Li spent the entire budget the school had set aside for building repairs on a top of the line polygraph machine, explaining that she had won it in a raffle. To deal with her inability to handle the budget for her school, Li would constantly force the students of Lawndale High to participate in forced fund-raising schemes of varying moral quality and enact rules calling for all mandatory attendance of all school events that charged admission prices with suspension as penalty for non-attendance. Li also was not above exploiting the school itself in order to make a quick buck, by allowing companies to recruit students via workshop classes ("This Year's Model") or going into business with vending machine companies that flooded the school with advertisements for soft drinks ("Fizz Ed"). 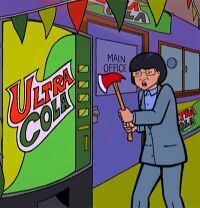 In the latter case, a combination of too much soda and too much pressure caused her to run amok in the school with a fire axe, chopping up vending machines. She was dragged to hospital but later released: how she was released is unknown. 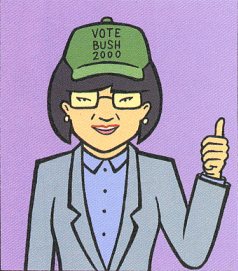 Li was a big fan of George W. Bush when he was governer of Texas because he had lots of people executed (see Daria and Politics), and she wrote to him asking for reference photos of one of his electric chair's and to support any bid he made for Presidency. Ms. Angela Li, principal of Lawndale High School. Mr. DeMartino is the only teacher at Lawndale High who has actively opposed Ms. Li's authority at the school, being the leader of the school's teachers union; in "Lucky Strike", he led a strike and successfully forced her to raise their wages. The only other teacher to take anything similar to that was Janet Barch, who bluntly asked about a raise in the same episode. As you explore Lawndale's "face on the webbing," I'm sure you will recognize the superior managerial derring-do that allows innovative projects such as this one to flourish. In addition to this site, I am thrilled to announce our newest high-tech wonder: the Track-Tastic system, which comprehensively cross-references confidential student information, local law-enforcement files, and multiple consumer-spending databases, all while continuously monitoring e-Bay for stun-gun auctions. Now if you're anything like me, the first thing on your mind when you contemplate our techno-laden future is: "What about those morally bankrupt online hooligans known by the disingenuously whimsical term, 'hackers?' Do they pose a threat to our computer nirvana?" Rest assured, people, that I will personally deal with any individual who attempts to compromise the integrity of our network. Such electronic skullduggery must and shall be nipped in the bud. To report any suspicious behavior in the computer lab or anywhere else on or off campus, in the continental United States or beyond, just stop by my office or drop a note into the brightly-painted "Tips" box outside my door. It goes without saying that all information received will be kept pretty confidential. Yours in Lawndale Pride, Angela Li Principal and Honorary Webmistress "
Angela Li was voiced by actor Nora Laudani, whose name was long thought by some to be a pseudonym for Saturday Night Live's Nora Dunn. The rumor was quashed when Laudani appeared on an episode of America's Who Wants To Be A Millionaire?. In the Latin American dubbing, she was voiced by Loretta Santini. Principal Li's exaggerated character traits often made her fanfic fodder. Canadibrit's fanfic saga involved her extensively. This page was last edited on 8 April 2018, at 10:45.